Be the first to share your favorite memory, photo or story of Hilma "Tootie". This memorial page is dedicated for family, friends and future generations to celebrate the life of their loved one. 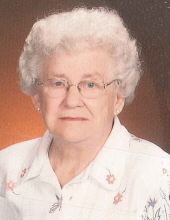 Hilma “Tootie” Husen, 96, of Grand Island passed away Monday, November 19, 2018 at Good Samaritan-Grand Island Village. Funeral services will be 10:30 AM, Saturday, November 24, 2018 at Livingston-Sondermann Funeral Chapel with Pastor Bill Pavuk officiating. Visitation will be Friday November 23, 2018 from 4:00-7:00 PM at Livingston-Sondermann Funeral Home Chapel. Burial will be Grand Island City Cemetery. Hilma was born October 9, 1922 in Grand Island to John and Elizabeth (Schlitt) Krieger. She graduated from Grand Island High School in 1941.She married William Husen on January 10, 1946 in Belleville, KS. She was a homemaker caring for her family, house, and garden. In later years she worked in the cafeteria at Barr Junior High School. She is survived by her children, Mike Husen of Fremont, NE, and Patricia (Duane) Scheel, of Grand Island, NE; six grandchildren; 15 great-grandchildren; and numerous nieces and nephews. She was preceded in death by her husband, William Husen; parents, John and Elizabeth (Schlitt) Krieger; four brothers; and six sisters. Memorials are suggested to the Good Samaritan Society and St. Pauls Lutheran Church. Online condolences and sharing of memories may be directed to www.livson.com. To send flowers or a remembrance gift to the family of Hilma "Tootie" Husen, please visit our Tribute Store. "Email Address" would like to share the life celebration of Hilma "Tootie" Husen. Click on the "link" to go to share a favorite memory or leave a condolence message for the family.